But it's not supposed to taste like an actual banana, but a Tokyo Banana, which is completely different (very little resemblance at all, really). Have you ever HAD a Tokyo Banana? Nope.  More of a sable girl when it comes to Tokyo omiyage, so I'll have to leave it to others as to whether it's a good representation of a Tokyo Banana. For me, it was just unpleasant and not worth the time spent queuing in the basement of Tokyo Station. Kit Kat should be more selective instead of churning one flavor after another. I've finding more mediocre flavors in recent years. About 10 years ago, most every gotouchi Kit Kat I had was good. I remember having jasmine tea, cappucino/espresso, Itokyuemon edition maccha one... all very good. Now a lot more misses than hits. They still sell the Itokyuemon one in Kyoto, but I find it hard to believe it's made the same as before. Unless the one I had before was different. Now tastes a lot blander and sweeter than I remember. I've not really been wowed by any Kit Kat recently. Those are wonderful - this is coming from someone who doesn't eat sweets. They have been available for quite some time though, I'm pretty sure. I first had them over two years ago. If you are thinking of KitKats as gifts and you want a bunch of different flavors, these would be great, although each box has only 12 KitKats packs (2 in each pack) and they cost 1,000 yen per box. They only got released recently (fall 2017?). I had a taste of this getting the sampler from NRT and it's been on my mind. But must I pay this much $$$$? 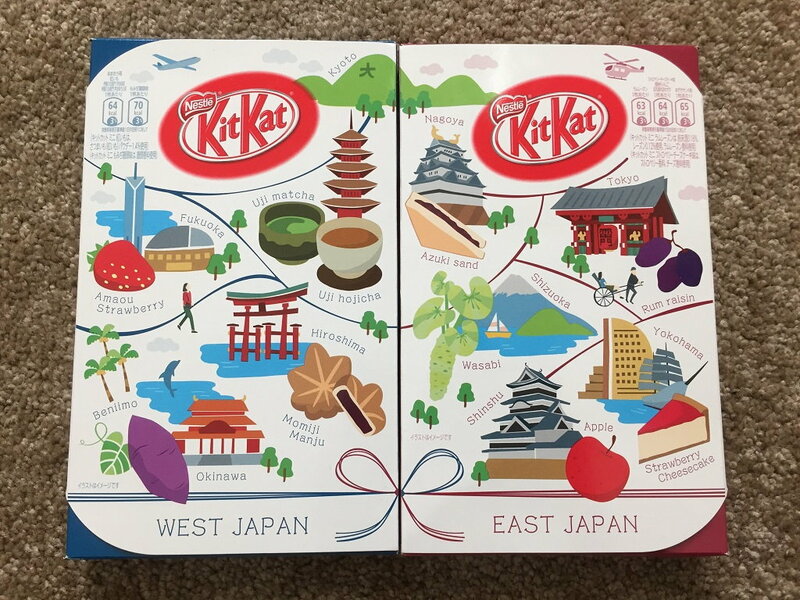 I live in Japan; according to my kids, there are more than 100 flavors of Kit Kat in Japan. As some other posters have said, some flavors are seasonal such as of course pumpkin around Halloween, and Sakura in the spring around cherry blossom season, but another interesting fact is that many flavors are not only seasonal, but only sold in certain areas of the country. There is no special mark up on any flavor that I have ever seen in a supermarket or convenience store. 12-packs of mini-bars cost about $3 or less, and full size bars are the same price as a normal Kit Kat. I can pick up a bag for around ¥300 on sale at the supermarket. Maybe has 13-15 per bag. I kind of take it for granted there will be a new flavor everywhere I go in the country. Otona (adult) dark chocolate is a favorite. Well of course all KitKat's are flavoured. But the idea that anything other than the original Kit Kat, produced in York, England by Rowntrees - who were bought by Nestle and then cynically closed down - is worth eating is , well, gross! And they have never been the same since they did away with the original 'silver paper' wrapping in a paper liner and replaced it with the plasticised junk which, I imagine, is now being eaten by turtles and whales! I thought I'd mention, I understand that Chrome browser will translate websites ( to English as well as other languages). The link below will also help translate websites between various languages. Can't wait to try these awesome flavors! The green tea flavor is surprisingly good! I love the strawberry kit-Kats! Picked up a huge box of them at NRT in February upon finishing the island Hopper. But the idea that anything other than the original Kit Kat, produced in York, England by Rowntrees - who were bought by Nestle and then cynically closed down - is worth eating is , well, gross! Have you even tried other flavors? Well of course all KitKat's are flavoured. But the idea that anything other than the original Kit Kat, produced in York, England by Rowntrees - who were bought by Nestle and then cynically closed down - is worth eating is , well, gross! Eating an original KitKat, produced in York, England by Rowntree before it was bought by Nestlé in 1988 is gross. That's a 30 year old sweet. Throw it away. The Kit Kat Tokyo Banana is quite nice. Scott in LA likes this.